1) Refurbished Barrels, which are sanded, varnished and with steel bands reinforced with rivets. 2) Raw Barrels, which are in the condition as received from the wineries of South Australia including the Barossa Valley. 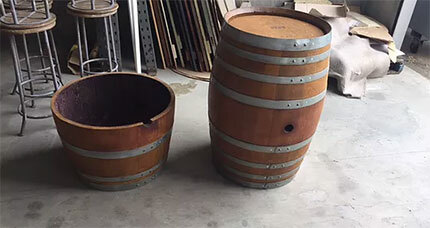 Surprise your guests with beautiful vintage wine barrels set in your patio, wine cellar or other seating areas. Available in different sizes, our wine barrels can suit any requirement. 1) Height 88 cm, at the top circumference is 60 cm, and in the middle (girth) varies from 68 cm to 70 cm. 2) Height 95 cm, at the top circumference is 57 cm, and in the middle (girth) varies from 66 cm to 70 cm. 3) Height 102 cm, at the top circumference is 66 cm, and in the middle (girth) varies from 70 cm to 75 cm. Prices vary from $300.00 plus GST to $420.00 plus GST. 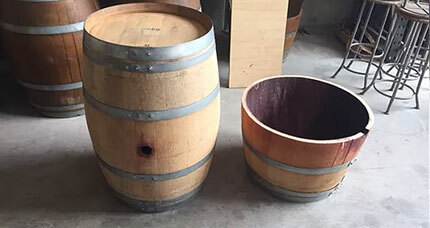 We have precisely cut and finished half wine barrels for sale in Sydney. These can used for planting small trees, citrus trees, herb gardens or any other plants. Discuss your requirements with us over the phone and place an order. We offer Sydney-wide delivery at rates negotiated with you. 1) Height 44 cm, at the top circumference is 68 cm to 70 cm. 2) Height 47 cm, at the top circumference is 65 to 67 cm. 3) Height 50 cm, at the top circumference is 70 cm to 74 cm. Prices vary from $150.00 plus GST to $195.00 plus GST.